Recently I spent some time researching countdown timers. I’ll be the first to admit this isn’t the most exciting project I have ever undertaken but nevertheless, it was very worthwhile. Since September I’ve been involved in the “A Day with Shopify” series of events and for this reason, wanted to ensure we had a solid countdown timer on the stage for the presenters to use. I consulted good friend Marc and received a couple of app recommendations and eventually settled on using Presentime for both the New York and Vancouver legs of the series. It’s a great app and well worth the small fee. The ability to view the remaining time from a secondary device as well as reset the timer remotely without wi-fi are both great features. The only downside is that you need an iPad, preferably a big one, to make use of it. 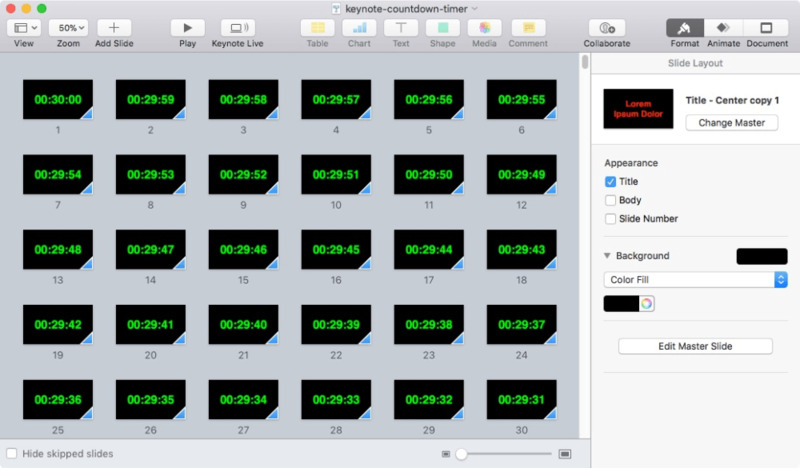 It got me thinking — surely it would be pretty straightforward to make use of Keynote and create a countdown timer that we could have displayed on a laptop or piped to a comfort monitor (nice and big) on the stage. It’s not revolutionary but might be useful to anyone out there running an event. It’s on GitHub — feel free to download a copy for your own use. This article was published by Keir Whitaker on November 04, 2017 in the Events category. You can view the blog archives and subscribe to RSS updates. Discuss this article with me by email.